43°47'20.46"N 6°58’09.06"E - cordinates for your sat nav. Beware that unless you have detailed French mapping then your Sat Nav might direct you around the houses. If in doubt please print off the fool-proof directions from the top of this page, you don't want to start your holiday with an argument! All the major International car hire companies are represented at Nice Airport. In the height of summer they can be desperately slow and have all the gallic charm of a Parisian waiter. If possible send a member of your group ahead in order to get your place in the queue early. We have no affiliation with any company or broker although many of our clients have used France Car and found they had very good prices. Just 5 minutes flying time from Nice airport and you're drink in hand enjoying your holiday. What could be better, and with summer prices from around €500 for 5 people one way, you don't have to be a Rock star to arrive like one. 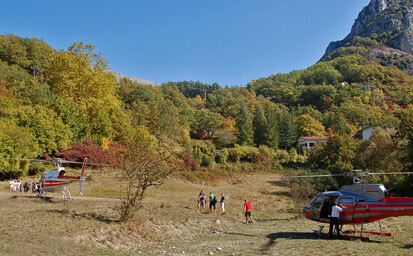 Go to Heli Air Monaco for more details - just quote Le Foulon and the address. If you're driving from the UK then on average visitors have taken 11 hours from Calais. This is based on going straight down the A7 Autoroute from Lyon before heading East on the A8 all the way to the Cote d'Azur and only brief stops for fuel. A much nicer way of doing the journey is to make it part of your holiday, stop half way after despatching flat less scenic northern France, driving via Grenoble and the A51/E712 to Sisteron before picking up the Route Napoleon. This road through the Alps is one of the most scenic anywhere in the World and highly recommended. See the printable link at the top of this page for directions.